As the Carnival is taking place this month on the Recreation Ground, this article has little snippets from our memories file about the ‘Rec’. Chris Clarke wrote to us about her mother, Dorothy Edwards, who was well known in the village for all that she did for the Muscular Dystrophy organisation. Dorothy set up a local branch of the Society called the Loddon Vale Branch and every year would hold a fete on the Rec. She would get a personality from the television to open it. Not only that she would arrange for a dance with a brass band in the village hall, as well. At one time, Dorothy held a grand dance at the Great Western Hotel at the station in Reading and persuaded Roy Castle to entertain the dancers, with his tap dancing and playing his trumpet. All for the charity. Other contributors to our memories file are Irene and John Elliott who told us about the Carnival Queen. Irene’s sister, Joyce, was once the Rose Queen who was voted to the position by the villagers of Spencers Wood. Mrs Magill of Highlands used to crown the Queen. Mrs Magill was married to Sandes Magill who was one of the first trustees of the village hall. The Magill’s would hold the Swallowfield and District Horticulture Show at Highlands every other year according to Janet Bunch. It was here that Janet would meet her friends Shirley and Melita Gregory who lived in painted wagons parked down Brookers Hill. Sandes Magill was well known in the neighbourhood for his community spirit being the vice-president of Spencers Wood British Legion, Chairman and one of the first trustees of the village hall, President of Spencers Wood Cricket Club amongst other positions. Mrs Magill also took an interest in local affairs and organised many fund-raising events. The final piece of information comes from Debbie Johnson Wait who with Liz Ratcliffe established the Spencers Wood Carnival back in 2007. Debbie and Liz wanted to do something for the community on a larger scale than just a fete. Liz had the idea of a carnival because living opposite the pavilion had noticed that very little happened there. Everyone looks forward to this as it involves local charities and everyone can take part. The local history group love it because we get so much information from local people and others who come from far and wide to attend the event. Not only that we share in the profits which pays for our website. You can hear more from Debbie on our website. This month’s column is a guest contribution by Professor Richard Hoyle who lives in Spencers Wood (and who contributed to the recent book, More from Our Village of Spencers Wood). History is not only about what happened; it is also about what might have happened, the road not taken. So it is fruitful to discuss what might have happened if the Armada had landed in 1588 or if there had been an invasion in 1940; or if Jim Callaghan had called an election in the autumn of 1978 rather than the Spring of 1979. Here we consider a ‘might have been’ on a smaller scale: the railway through Spencers Wood. The year is 1909. Private cars are beginning to appear, as are petrol-driven buses and lorries. But the future was not so obvious at the time and public discourse was still about trains. The Berkshire Chronicle carried a flurry of articles about stations and train services, prompted by the success of Reading West station (opened in 1906) and suggestions that a station might be built to serve Palmer Park (then a developing suburb). But an article by ‘Q. T.’ drew attention to another grievance: the poor connections at Basingstoke between trains from Salisbury and the south-west (the London and South Western Railway) and trains from Basingstoke to Reading (Great Western Railway). The last train of the day from Exeter arrived at 9.11: the last connecting train to Reading left at 9.10. Obviously, this was no accident. Q. T. wanted a much better service. The following week the President of the Reading Chamber of Commerce made a different suggestion: that the LSWR should continue its recently built line from Alton to Basingstoke through Sherfield, Spencers Wood and Three Mile Cross to Reading. This would open up the area to the south and west of Reading which had (and indeed has) poor railway facilities. A couple of months later ‘Q. T.’ reported on a meeting of the Railway Institute at Reading where this idea, and others, were discussed. The idea which the Institute favoured was a new line, leaving the Waterloo line west of Earley station and then travelling cross-country through Shinfield, Spencers Wood, Swallowfield and Sherfield, before connecting with the Basingstoke-Waterloo line near Hook. The Institute thought that the line would not be expensive to build, being only 15 miles long and without any great engineering problems to overcome. It would serve the ‘populous districts of Shinfield and Spencers Wood’ whilst giving a direct route to Portsmouth, Bournemouth etc. The Berkshire Chronicle was all in favour: but little more was heard of the idea. Whether the London and South Western Railway gave it more than a moment’s thought is unknown and the agreement in the summer of 1910 that the LSWR and GWR should co-operate more closely made it redundant anyhow. In retrospect the idea was completely daft. And if the line had been built, it would probably have never carried much traffic, making it exactly the sort of line that Dr Beeching would have identified as hopelessly uneconomic half a century later. It seems unlikely that readers of Loddon Reach would ever have had the option of waiting for the Reading train rather than the Reading bus. On the other hand, a station in Spencers Wood would inevitably have changed the character of the village and encouraged house building: indeed, as we have seen, the development of the area was part of the justification for the building the line. And so, if the line had come to pass, twentieth-century Spencers Wood would have been very different, but this was not so much the road not taken as the line not built. 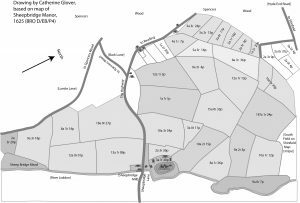 When we were researching the first chapter of our book, More from Our Village of Spencers Wood, ‘Before the Village’, we discovered that the common ‘belonged to’ not one but several manors. In the Berkshire Record Office there are maps of three of these manors, Diddenham to the north-west (c.1760), Shinfield to the north-east (1756), and Little Shipridge (Sheepbridge) to the south-east (1625). If we’d found a map of the manor of Bealmes, we could – we fancied – have put them together and the hole in the middle would have been an outline of the common. The maps of Diddenham and Shinfield are gorgeous but it was the 1625 map that fascinated me. It’s not very big, and it’s extremely dark and mottled. We could only see the detail by ‘enhancing’ the photos in Photoshop! (What you see here are my ‘tracings’ of the map.) There were two things in particular that I loved about it: the detailed drawings of scattered houses and even the mill (1), complete with mill wheel! The manor house is a larger, more detailed version of the others (2). North isn’t at the top of the map, because the manor’s southern boundary was the River Loddon, which they put along the bottom, with the moated manor house half way along it. ‘Spencers Wood’ is written across the top, twice, hinting that there was then a long thin wood running roughly N-S. You can see Lambs Lane (3) and Back Lane (4), both marked ‘to Spencers Wood’. There are two buildings drawn at the top end of the field across the main road from the junction with Back Lane (5), two on the bend where ‘Sheepbridge Cottages’ are, and one opposite them (6). The ‘Highway’ (marked ‘to Reading’) corresponds to the current main road until it reaches the corner of the field just before the two houses opposite Hill View (7). You can then see two buildings, one about where Body’s Farm now is and another just below it. The road is shown as running between them. The other interesting thing was that many of the field boundaries of 400 years ago were almost exactly as they are today. Most of the fields marked on this map, with their size in acres, roods and perches, are still farmed: the built-up bit we now know as Spencers Wood – on both sides of Basingstoke Road – was part of the common, and therefore off the map – indeed it was off all the maps! Before the late nineteenth century, Spencers Wood could only be seen out of the corner of your eye.